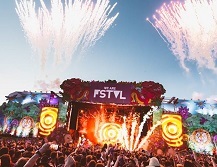 We Are Fstvl will unofficially be kicking off festival season this month and with demand for tickets showing no sign of slowing, this week could be your last chance to get involved. Taking place on Saturday 28th and Sunday 29th May in Upminster, you can expect to witness an array of 200 artists in attendance, across sixteen stages alomg with 50,000 of your fellow ravers. The Essex festival set upon Damyn’s Hall Aerodrome (less than an hour from Central London) will be bringing you their biggest line up yet and they’ve some serious notches on their belt so you don’t have to take our word for it – ‘Best Medium Sized Festival,’ ‘Winner of Best New Festival’ and ‘Best International Festival.’ No biggie but We Are Fstvl is one of the most talked about, rapidly growing and most anticipated dance events of the summer. Whittling down some of our favourite acts was hard but we’re buzzing to see Fatboy Slim, DJ Fresh, Amine Edge & Dance, DJ SKT, MK, Hannah Wants, Shy FX, Monki, Norman Jay MBE and Eats Everything on the Saturday, covering event brands from Half Baked Records, UKF, LoveJuice and Used & Abused. Sunday brings you Steve Angello, Craig David’s T2, Mistajam, Sven Vath, Richie Hawtin, Sub Focus and Hot Since 82, from respected brands Abode, Hospitality, Cocoon and Defected in The House. This year everything will be bigger and better, with five brand new zones to explore: Ancient Realm, Favela Fiesta, Island Hideaway, WHSE District and Disco Tropics – it’s enough to conjure up the colourful memories you could be making this May bank holiday. For final tickets, group deals and to see what else is up their sleeves, you’ll want to click here now.